Synagogue in Wieniawa was erected in the 1st half of the 19th century. It was the only brick building in the town of Wieniawa. Synagogue in Wieniawa was erected in the 1st half of the 19th century. It was the only brick building in the town of Wieniawa. It was abandoned probably before 1909. At that very time it subsequently fell into decay. 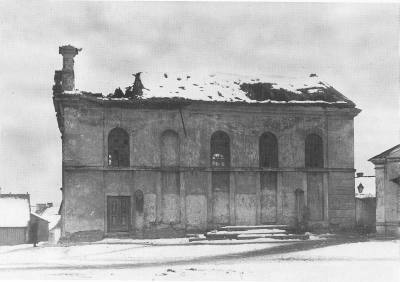 Poor condition of the synagogue is confirmed by Majer Bałaban’s description in his book Żydowskie miasto w Lublinie (‘The Jewish town in Lublin’). After Wieniawa had been incorporated into Lublin in 1916, the synagogue underwent repairs, owing to efforts of local Jewish community, probably around 1920. Measurement drawings of the building from that period are preserved, drawn by engineer architect Jerzy Siennicki. In 1940, after displacement of Jews from Wieniawa, building was demolished. Synagogue was built on an elongated plan, situated on the east-west axis. Its cuboidal body was compact, divided into two storeys by a cornice and covered with pitched roof. A hallway, with separate stairs leading to the women’s gallery on the 1st floor, adjoins the western side of the synagogue. The main hall measures ca. 12 x 10 m. Western elevation was disjointed into three parts of equal width by use of four classicised pilasters. Entablature of the western elevation was coped with a tympanum situated against a corbie step. Windows of the main hall and the women’s hall were deployed regularly along the walls. All of the windows, with arch lintels, were situated on the same level. There were three windows in each of eastern and western walls. Northern and southern walls had three windows from the main hall and one from women’s gallery each. A cornice ran at the level of window sills. Bałaban M., Żydowskie miasto w Lublinie, reprint, Lublin 1991. Kuwałek R., Wysok W., Lublin. Jerozolima Królestwa Polskiego, Lublin 2001. Piechotkowie M. i K., Bramy Nieba. Bożnice murowane na ziemiach dawnej Rzeczypospolitej, Warszawa 1999.